We used 15cm of silver for many years, but as we have been lost, I did not notice that there was a difference in color, and I bought "Sten", but I bought this "Silver" once again because it was difficult to see it reflecting. Silver has a matte finish and looks whitish, so it is easy to see the black scale from various angles. Because Sten is reflective, depending on the viewing angle, it is difficult to see. I think 15cm is good for fine work. This review is about item#2450366. I got lost as to which one to buy stainless steel, but it is easy to see for a minute that this person does not reflect. It is a mistake with a monotaur. I do not warp and the burr processing is also solid. It is used for approximate measurement. Because it is made by Shinwa, we are satisfied with high reliability. Memory is also easy to see and use. I am using PB's 60, but since PB can be used without problems, it may be preferable to choose it? This review is about item#02450384. I am trying to cut paper with a cutter. I think that there is no difference in the quality of these staple items, so I think that it is a cheap PB. This review is about item#2450384. It is easy to use, very convenient to use for detailed work of woodworking. It is a classic linear scale. Because there are also many opportunities to use, emphasis on ease of use. It is good that the memory does not shine as compared with the sten's object and it looks sharp. 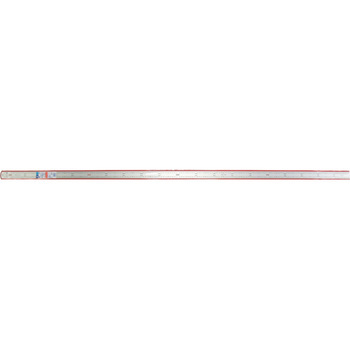 From 150 mm to 1000 mm, rulers are all using Shinwa's straight silver. I like the accuracy and moderate weight and hardness. Since the hole of the same diameter is opened at the end, it is convenient to hang it on the wall and organize it. This review is about item#02450375. It is good that there is no margin from the left end and it is not mad. This review is about item#2450375. There is no comment especially because it is a reliable company. Memory is easy to see. Very easy to use. Easy to read graduations at any angle. The thickness was also sufficient and the accuracy was satisfactory, it was bargain-priced at a flyer price. As a ruler, it is easy to see, it is good for cutting when cutting materials. Shinwa's measured product is very satisfying, both reliability, quality and texture are excellent. I bought 30 cm, 1 m of the company's products desiring it I want 60 cm this time though it is in use. It was reliable because it was a maker item and it was good as it was able to purchase cheaply. Silver seems to make it easier to see the scale. Is it no longer a standard? Measuring the remaining amount by hitting the pad with custard, the number of times to use is large. Packing is also solid, the proofreader of the manufacturer, Shinwa, is enclosed properly, you can purchase with confidence. This review is about item#61080513. I have liked it since long ago and use it. It is a rugged and secure brand. I can use it without problems with a maker item. Because it is a maker item, it can be relieved about accuracy. It can also be used to empty the package box.